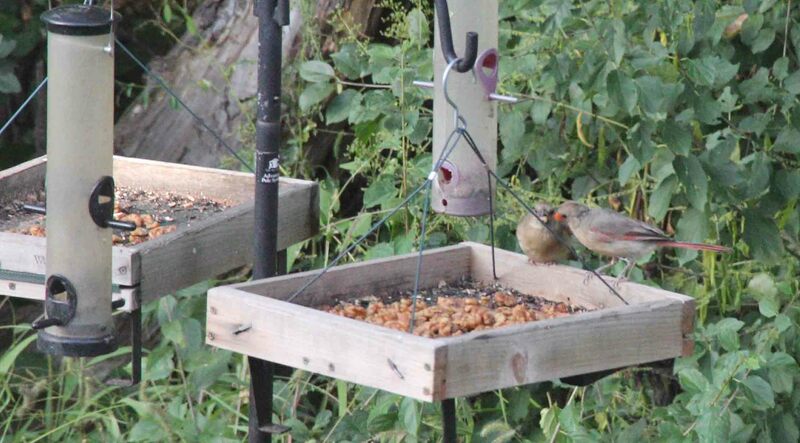 My favorite moments are when the parent birds bring their babies to our feeders and show them how to eat. I don’t know why but it stops me in my tracks every time. The natural and spontaneous affection between Mama Cardinal and Baby is both endearing and instructive. The baby is trusting. The parent is protective and gentle. It scares me when I watch the animals for any length of time. It scares me because they behave just like we do in so many ways. And I wonder if, just because we can agonize over every move, (Am I at the right feeder? Will this feeder always be there for my baby? Is the food here healthy? Am I teaching my baby the right things?) does that make us any different than the birds? When all is said and done, we may be a little more complex and wonder about a few more things. But it’s all a matter of degree isn’t it. I can question more, care about more, work more, worry about more, suffer more. But do I enjoy more? The animals in our yard seem blissfully content with their lives. Every day they teach me something new. This entry was posted in Gardening, landscape, midwest, Nature and tagged cardinals, squirrels by edges. Bookmark the permalink.